The United States Coast Guard (USCG) is a branch of the United States Armed Forces and one of the country's seven uniformed services. The Coast Guard is a maritime, military, multi-mission service unique among the U.S. military branches for having a maritime law enforcement mission (with jurisdiction in both domestic and international waters) and a federal regulatory agency mission as part of its mission set. It operates under the U.S. Department of Homeland Security during peacetime, and can be transferred to the U.S. Department of the Navy by the U.S. President at any time, or by the U.S. Congress during times of war. To date, this has happened twice, in 1917 and 1941, during World War I and World War II, respectively. Created by Congress on 4 August 1790 at the request of Alexander Hamilton as the "Revenue Marine", it is the oldest continuous seagoing service of the United States, although the U.S. Navy lists its founding as 1775, the formation of the Continental Navy. However, that was disbanded in 1785, and the modern U.S. Navy in its present form was founded in 1794. As Secretary of the Treasury, Hamilton headed the Revenue Marine, whose original purpose was that of a collector of customs duties in the nation's seaports. By the 1860s the service was known as the U.S. Revenue Cutter Service and the term Revenue Marine gradually fell into disuse. The Coast Guard was formed from the merger of the Revenue Cutter Service and the U.S. Department of the Treasury. As one of the country's five armed services, the Coast Guard has been involved in every war from 1790 up to the Iraq War and the War in Afghanistan. As of 2012 the Coast Guard had approximately 42,000 men and women on active duty, 7,900 reservists, 32,000 auxiliarists, and 8,700 full-time civilian employees. In terms of size, the U.S. Coast Guard by itself is the world's 12th largest naval force. The Coast Guard's legal authority differs from the other four armed services: it operates simultaneously under Title 10 of the U.S. Department of Defense or directly for the President in accordance with Title 14 USC 1–3. The Coast Guard's enduring roles are maritime safety, security, and stewardship. To carry out those roles the Coast Guard has 11 statutory missions as defined in , which include enforcing U.S. law in the world's largest exclusive economic zone of 3.4 million square miles (8,800,000 km2). The Coast Guard motto is Semper Paratus (English: Always ready). A boatswain’s mate watches from the side port door as Coast Guard Cutter Bertholf’s Over-The-Horizon small boat departs to receive personnel from Coast Guard Cutter Chandeleur. The Coast Guard has roles in maritime homeland security, maritime law enforcement (MLE), search and rescue (SAR), marine environmental protection (MEP), and the maintenance of river, intracoastal and offshore aids to navigation (ATON). A Coast Guard rescue swimmer assisting with the rescue of a pregnant woman during Hurricane Katrina. 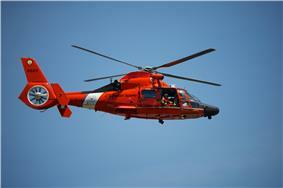 While not the oldest, search and rescue (SAR) is one of the Coast Guard's best known missions. The National Search and Rescue Plan designates the Coast Guard as the federal agency responsible for maritime SAR operations, and the United States Air Force as the federal agency responsible for inland SAR. Both agencies maintain rescue coordination centers to coordinate this effort, and have responsibility for both military and civilian search and rescue. The two services jointly provide instructor staff for the National Search and Rescue School that trains SAR mission planners and coordinators. Previously located on Governor's Island, New York, the school is now located at Coast Guard Training Center Yorktown at Yorktown, Virginia. Dolbow, Jim (2012). The Coast Guardsman's Manual (10th ed.). Naval Institute Press, Annapolis, Maryland. ^ a b c "Coast Guard Snapshot 2012" (PDF). United States Coast Guard. Retrieved 3 February 2013. ^ "Homeland Security Budget-in-Brief Fiscal Year 2009" (PDF). ^ a b c United States Coast Guard. "Daily Chronology of Coast Guard History". United States Department of Homeland Security. 2003 - Administrative control of the Coast Guard transferred to the newly created Department of Homeland Security from the Department of Transportation, where it had served since 1 April 1967. ^ United States Coast Guard. "Timeline of Coast Guard Organizational History". United States Department of Homeland Security. Retrieved 18 January 2014. 1 April 1967: Executive Order 16781 transferred the Coast Guard from the Treasury Department to the newly-formed Department of Transportation. ^ a b United States Coast Guard. "Timeline of Coast Guard Organizational History". United States Department of Homeland Security. Retrieved 18 January 2014. 1 November 1941: President Roosevelt's Executive Order 8929 transferred the Coast Guard to Navy Department control. In compliance with Executive Order 9666, the Coast Guard returned to Treasury Department control. ^ United States Coast Guard. "Timeline of Coast Guard Organizational History". United States Department of Homeland Security. Retrieved 18 January 2014. 28 August 1919: Coast Guard reverted to Treasury Department after President Wilson signed Executive Order 3160. ^ a b United States Coast Guard. "Timeline of Coast Guard Organizational History". United States Department of Homeland Security. Retrieved 18 January 2014. 6 April 1917: With the declaration of war against Germany the Coast Guard was transferred by Executive Order to the control of the Navy Department. ^ "An Act To create the Coast Guard by combining therein the existing Life-Saving Service and Revenue-Cutter Service". January 1915. Retrieved 8 September 2013. Be it enacted by the Senate and House of Representatives o the United States of America in Congress assembled, That there shall be established in lieu of the existing Revenue-Cutter Service and the Life-Saving Service, to be composed of those two existing organizations, with the existing offices and positions and the incumbent officers and men of those two services, the Coast Guard, which shall constitute a part of the military forces of the United States and which shall operate under the Treasury Department in time of peace and operate as a part of the Navy, subject to the orders of the Secretary of the Navy, in time of war or when the President shall so direct. When subject to the Secretary of the Navy in time of war the expense of the Coast Guard shall be paid by the Navy Department; Provided, That no provision of this Act shall be construed as giving any officer of either the Coast Guard or the Navy, military or other control at any time over any vessel, officer, or man of the other service except by direction of the President. ^ a b c d "U.S. Coast Guard Heraldry" (PDF). United States Coast Guard. April 2011. pp. 3–1. COMDTINST M5200.14A. ^ Johnson, Robert Irwin (1987). Guardians of the Sea, History of the United States Coast Guard, 1915 to the Present. Annapolis, Maryland: Naval Institute Press. pp. 1–2. ^ Scheina, Robert (11 October 2012). "The U.S. Coast Guard at War". Coast Guard Historian's Office. ^ LaRouche, Monique (2012). "The Coast Guard RAIDs Afghanistan". Reservist (U.S. Coast Guard) LXI (1): 18. ^ Stone, Andrea (21 December 2011). "Coast Guard Cutters Rust Away, Break Down". ^ The Coast Guard Gets It Right Amanda Ripley. TIME. 23 October 2005. ^ "National Search and Rescue Plan (USA) 2007". Uscg.mil. 2012-06-22. Retrieved 2013-02-03. ^ "National Search And Rescue Committee". U. S. Coast Guard Office of Search and Rescue. U.S. Coast Guard. Retrieved 26 March 2013. ^ "National Oil and Hazardous Substances Pollution Contingency Plan". epa.gov. Retrieved 2 December 2014. ^ "10 USC §101. Definitions" (PDF). ^ "14 USC §1. Establishment of Coast Guard" (PDF). ^ "Homeland Security Act of 2002" (PDF). ^ Baldinelli, D.C. (9 December 2002). "The U.S. Coast Guard's Assignment to the Department of Homeland Security: Entering Uncharted Waters or Just a Course Correction?". United States Coast Guard. United States Department of Homeland Security. Retrieved 18 January 2014. On November 25, 2002, President George Bush signed the Homeland Security Act, which called for the largest reorganization in the U.S. government since the formation of the Department of Defense. The reorganization plan will bring together twenty-two agencies or parts of agencies from other departments such as Justice, Commerce, Health and Human Services, etc., under the control of the Department of Homeland Security. Often such large administrative reorganizations inevitability causes a great deal of upheaval and anxiety in the affected organizations. One of those agencies affected is the United States Coast Guard, which will be transferred from the Department of Transportation. ^ a b Garamone, Jim (17 October 2007). "Sea Services Unveil New Maritime Strategy". Navy News Service. ^ "14 USC §2. Primary duties" (PDF). ^ "14 USC §89. Law enforcement" (PDF). ^ "18 USC §1385. Use of Army and Air Force as posse comitatus" (PDF). ^ "14 USC §143. 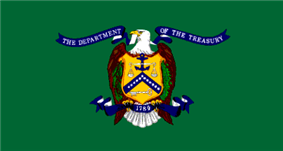 Treasury Department" (PDF). ^ "19 USC §1401. (i) Officer of the customs; customs officer" (PDF). ^ "19 USC §1589a. Enforcement authority of customs officers" (PDF). ^ "Federal Law Enforcement Survey of Federal Civilian Law Enforcement Functions and Authorities" (PDF). ^ "Law Enforcement Survey Table". ^ "People v. Booth, ___ N.Y.S.2d ___, 2008 WL 2247068, 2008 N.Y. Slip. Op. 28206 (N.Y. Co.Ct. 2008)" (PDF). 24 May 2008. ^ Ripley, Amanda (23 October 2005). "How the Coast Guard Gets it Right". ^ U.S. Coast Guard Historian's Office. Chronology of Aids to Navigation and the United States Lighthouse Service. http://www.uscg.mil/history/articles/h_USLHSchron.asp Retrieved: 28 February 2014. ^ U.S. Coast Guard Historian's Office.The Steamboat Inspection Service & the History of Merchant Vessel Inspection. http://www.uscg.mil/history/articles/Steamboat_Inspection_Service.asp Retrieved: 28 February 2014. ^ Cacas, Max (10 September 2009). "DHS marks new milestone with St. E's campus groundbreaking". ^ a b "14 USC §41. Grades and ratings" (PDF). ^ "37 USC §201. Pay grades: assignment to; general rules" (PDF). ^ "Required Uniforms". USCG Uniform Distribution Center. 23 May 2013. ^ "History of the Coast Guard Reserve". Coast Guard Historian's Office. 26 January 2012. ^ "Women & the US Coast Guard". Coast Guard Historian's Office. 16 July 2013. ^ "USCG Civilian Careers". United States Coast Guard. 28 June 2013. ^ "United States Coast Guard Regulations" (PDF). 1992. COMDINSTM 5000.3B. ^ "420-foot Icebreaker (WAGB)". Aircraft, Boats, and Cutters: Cutters. 28 June 2013. ^ "399-foot Polar Class Icebreakers (WAGB)". Aircraft, Boats, and Cutters: Cutters. 28 June 2013. ^ "Alaska Lt. Gov. calls for US icebreakers". ^ "Northrop Grumman to Supply Polar Ice Breaker Navigation Support for U.S. Coast Guard". October 20, 2013. ^ "U.S. Coast Guard Barque Eagle (WIX-327)". Aircraft, Boats, and Cutters: Cutters. 28 June 2013. ^ "140-foot Icebreaking Tug (WTGB) - Bay Class". Aircraft, Boats, and Cutters: Cutters. 28 June 2013. ^ "110-foot Patrol Boat (WPB) - Island Class". Aircraft, Boats, and Cutters: Cutters. 28 June 2013. ^ "87-foot Coastal Patrol Boat (WPB) - Marine Protector Class". Aircraft, Boats, and Cutters: Cutters. 28 June 2013. ^ "HC-130H: Hercules". Office of Aviation Forces (CG-711). 28 June 2013. ^ "HC-130J: Super Hercules". Office of Aviation Forces (CG-711). 28 June 2013. ^ "HC-144A: Ocean Sentry". Office of Aviation Forces (CG-711). 2 July 2013. ^ """HH-60J Sea Hawk / "Jayhawk. GlobalSecurity. Retrieved 7 August 2013. ^ "HH/MH-65C: Dolphin". Office of Aviation Forces (CG-711). 28 June 2013. ^ "C-37A: Gulfstream V". Office of Aviation Forces (CG-711). 28 June 2013. ^ "Chatham Boats". Station Chatham. 28 June 2013. ^ "United States Coast Guard Core Values". ^ "United States Coast Guard Ethos". Training Center Cape May. ^ "The Guardian Ethos" (PDF). 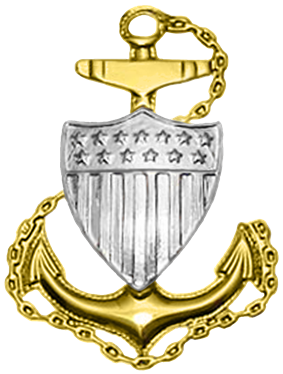 U.S. Coast Guard Posture Statement. United States Coast Guard. February 2008. p. 17. ^ "Shipmates 17 - The Coast Guard Ethos" (txt). CGMS General Messages. 30 November 2011. ALCOAST 554/11. ^ "Harry G. Hamlet 1932-1936". Coast Guard Historian's Office. 26 January 2012. ^ Hamlet, Harry G. (10 October 2012). "Creed of the United States Coast Guardsman". Coast Guard History: Frequently Asked Questions. Coast Guard Historian's Office. ^ "What is the origin of the saying "You have to go out, but you don't have to come back"?". Coast Guard History: Frequently Asked Questions. Coast Guard Historian's Office. 10 October 2012. ^ "U.S. Coast Guard Flags". Coast Guard Historian's Office. 26 January 2012. ^ "The Coast Guard Ensign". Coast Guard Historian's Office. ^ Saba, Anne (January 2000). "Tradition, Service, Honor: The Customs Ensign". U.S. Customs Today. ^ "Coast Guard Ensign (For Release)". Visual Information gallery. 30 June 1999. ^ Thiesen, William H., PhD (Summer 2012). "The History of the 'Racing Stripe' Emblem and Brand" (PDF). ^ "U.S. Coast Guard Coatings and Color manual" (PDF). Coast Guard Historian's Office. 16 July 1973. CG-263. ^ "Coatings And Color Manual" (PDF). CG-612 Directives and Publications Division. 11 March 2005. COMDTINST M10360.3C. 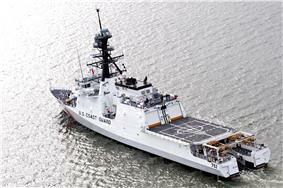 ^ "When did the Coast Guard adopt the "slash" for its cutters, boats, and aircraft?". Coast Guard History: Frequently Asked Questions. Coast Guard Historian's Office. 14 February 2013. 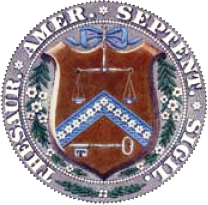 ^ Semper Paratus (wav). U.S. Coast Guard Chief Petty Officers Association Enlisted Association (Sound recording). Archived from the original on 17 January 2013. ^ "Pantone chart with RGB and HTML conversions" (PDF). Planet Guide. Retrieved 8 August 2013. ^ "Uniform Regulations" (PDF). Coast Guard Historian's Office. 18 February 2009. COMDTINST M1020.6F. ^ a b "Honoring Our Profession - Uniform Guidance and Results of Uniform Board No. 44" (txt). CGMS General Messages. ALCOAST 291/11. Retrieved 27 July 2011. ^ "Title unknown". Defense Technology International: 26. January–February 2007. ^ "U.S. Great Lakes proposed permanent safety zones information site". Ninth Coast Guard District. ^ "Safety Zones; U.S. Coast Guard Water Training Areas, Great Lakes" (PDF). ^ "U.S. machine-gun fire suspended on Great Lakes". ^ "Some up in arms over fire zones". ^ "Coast GuardPlan". Citizens for Lake Safety. Retrieved 9 August 2013. ^ "Coast Guard Expects New Deployable Group Operating By Next Summer" (PDF). Senior Coast Guard Leadership. Retrieved 3 February 2013. ^ "14 USC PART II—Coast Guard Reserve and Auxiliary" (PDF). ^ "CG Auxiliary Vessel Examiner Manual" (PDF). CG-612 Directives and Publications Division. 20 August 1996. COMDTINST M16796.2E. ^ "33 CFR § 5.31 Power and authority" (PDF). ^ a b "SM1c Douglas Albert Munro". Coast Guard Historian's Office. 10 October 2012. ^ "Ancient Albatross Award". Ancient Order of the Pterodactyl. Retrieved 3 February 2013. ^ Chidlow, Nora L. "The Bird That Continues to Fly: A History of the Ancient Albatross Award" (PDF). Coast Guard Historian's Office. ^ "Coast Guard CW Operators Association". ^ "U.S. Coast Guard Chief Petty Officers Association". ^ "USCG Chief Warrant and Warrant Officers Association". ^ Wise, James E., Jr.; Rehill, Anne Collier (1997). Stars in Blue: Movie Actors in America's Sea Services. Annapolis: Naval Institute Press. p. 293. ^ "Coast Guard". Film. Retrieved 25 December 2009. ^ "Coast Guard Episodes 1995, TV Show". TV Guide online. 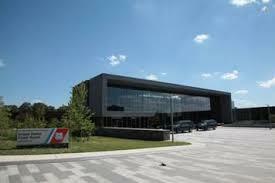 CBS Interactive. Retrieved 1 July 2014. ^ "Coast Guard (1995–1997) TV Series - Reality-TV". Internet Movie Data Base. Amazon.com. Retrieved 1 July 2014. Sea Hunt, Coast Guard involved in several episodes. Flipper, various Coast Guard HH-52 Seaguard helicopters were used. Gilligans Island, the passengers and crew were all rescued by the Coast Guard. Emergency!, Coast Guard HH-52 Seaguard helicopters and boats were used in various rescues. Boston Legal, the characters of Alan Shore and Denny Crane, portrayed by James Spader and William Shatner, respectively, join the Coast Guard Auxiliary. Cartoon character Popeye was in the Coast Guard after being a Merchant Mariner. He later joined the Navy. Unnamed Coast Guardsmen of a Law Enforcement Detachment were featured in a Channel 5 documentary Royal Navy Caribbean Patrol. They were serving aboard HMS Manchester, a British Royal Navy ship combating drug smugglers in the Caribbean. Coast Guard Alaska: Search and Rescue, a series on The Weather Channel that features a Coast Guard search-and-rescue unit based in Kodiak, Alaska. Coast Guard Florida: Search and Rescue, a series in production on The Weather Channel that features Coast Guard search-and-rescue units based in Miami and Clearwater, Florida. Coast Guard Cape Disappointment: Pacific Northwest, a series in production on The Weather Channel that features Coast Guard Station Cape Disappointment based in Ilwaco, Washington and Coast Guard Air Station Astoria in Warrenton, Oregon. The Coast Guard has been featured in several television series, including Baywatch, CSI: Miami, NCIS, Deadliest Catch, Dirty Jobs, Harbor Command, "Burn Notice" and Miami Vice. Fighting Coast Guard, a 1951 drama, depicts Coast Guard trained to help win WWII. Onionhead, a 1957 comedy, portrayes Andy Griffith as a Coast Guard recruit. Thunderball (1965), involves James Bond played by Sean Connery being hoisted by an HH-52 Seaguard. Assault on a Queen, a 1966 film starring Frank Sinatra and Verna Lisi, featured USCGC Androscoggin. The Boatniks, a 1970 Disney comedy film, depicts Ensign Tom Garland, played by Robert Morse, as the commander of a small cutter on the West Coast. Satan's Triangle, a 1975 TV movie, involves a United States Coast Guard helicopter sent to answer a distress call from inside the Bermuda Triangle. The Last Flight of Noah's Ark, a 1976 Walt Disney movie. Elliot Gould and crew towed home in B-29 Fuselage boat by a Coast Guard cutter. The Island (1980 film)|The Island (1980). Latter-day Caribbean pirates capture the (fictional) cutter USCGC New Hope. Filming was done on USCGC Dauntless. Splash (1986). Coast Guard (fake) helicopters drop Coast Guard divers into New York Harbor. Top Gun, Maverick and Goose's body are pulled from the ocean by a Coast Guard HH-3F Pelican. Overboard, 1987 comedy, features a Coast Guard cutter and crew intercepting a private yacht. Licence to Kill, 1989, James Bond captures a drug dealer while flying in a Coast Guard HH-65 Dolphin in Florida. The Perfect Storm, 2000 film, depicted the rescue operations of the USCGC Tamaroa as one of its subplots. Bad Boys II, 2003 film, depicts counter-drug helicopters from the Helicopter Interdiction Tactical Squadron (HITRON). Yours, Mine, and Ours, 2005 family comedy, Dennis Quaid plays a fictional U.S. Coast Guard Academy superintendent who marries a character played by Rene Russo; together, they have 18 children. The Guardian, 2006 film, starring Kevin Costner and Ashton Kutcher, was based on the training and operations of Coast Guard Aviation Survival Technicians. Pain & Gain, 2013 film, starring Dwayne Johnson and Mark Wahlberg, depicted the Coast Guard Deployable Operations Group in action. A Coast Guard cutter and its commanding officer and crew figured prominently in Tom Clancy's books Clear and Present Danger, Without Remorse, and Executive Orders. 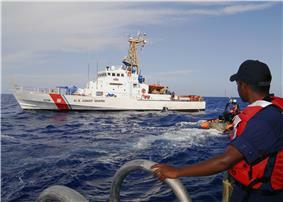 EagleUSCGC , figures prominently in S.M. Stirling's book Island in the Sea of Time. The 2005 survival horror video game, Cold Fear, depicts a Coast Guardsman investigating paranormal events aboard a Russian whaling ship, and an oil rig later in the game. 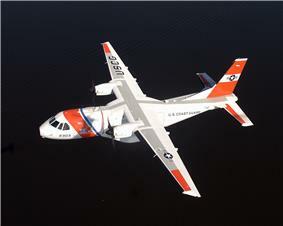 Flight Simulator X: Acceleration features an EH101 in U.S. Coast Guard colors. 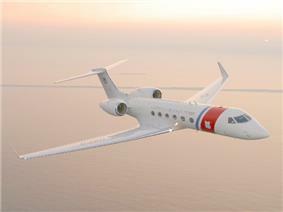 However, the USCG does not operate these aircraft. The U.S. Coast Guard appears as gameplay adversaries in Jaws Unleashed, including cutters and helicopters. Deadliest Catch: Alaskan Storm features the U.S. Coast Guard. Former Coast Guard officers have been appointed to numerous civilian government offices. After retiring as Commandant of the Coast Guard in 2002, Admiral White House Chief Usher, beginning service on 12 March 2007, and continues to serve in the same capacity under President Barack Obama. Numerous celebrities have served in the Coast Guard including tennis player Jack Kramer, golfer Arnold Palmer, All Star baseball player Sid Gordon, boxer Jack Dempsey; musicians Kai Winding, Rudy Vallee, Derroll Adams, and Tom Waits; actors Buddy Ebsen, Sid Caesar, Victor Mature, Richard Cromwell, Alan Hale, Jr., William Hopper, Beau Bridges, Cesar Romero; author Alex Haley; and Senator Claiborne Pell. In May 2006, at the Change of Command ceremony when Admiral Coast Guard Presidential Unit Citation with hurricane device, for its efforts during and after Hurricane Katrina and Tropical Storm Rita. Prior to 1997, Auxiliarists were limited to those tasks and on-water patrols supporting recreational boating safety. In 1997, however, new legislation authorized the Auxiliary to participate in any and all Coast Guard missions except direct military and direct law enforcement. Auxiliarists may support the law enforcement mission of the Coast Guard but may not directly participate in it, and Auxiliarists and their vessels are not permitted to carry a weapon while serving in any Auxiliary capacity. 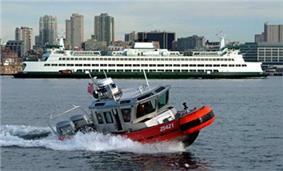 Auxiliarists use their own vessel (e.g., boats, aircraft, and vehicles), once it is registered as a Coast Guard Facility, in Coast Guard missions. The Reserve is managed by the Acting Director of Reserve and Leadership (CG-13), Rear Admiral David R. Callahan. Since 11 September 2001, over 8,500 reservists have been activated and served on tours of active duty, to include deployments to the Persian Gulf and also as parts of Department of Defense combatant commands such as the U.S. Northern and Central Commands. 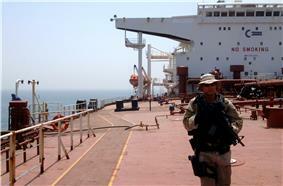 Coast Guard Port Security Units are entirely staffed with reservists, except for five to seven active duty personnel. Additionally, most of the staffing the Coast Guard provides to the Navy Expeditionary Combat Command are reservists. The United States Coast Guard Reserve is the reserve military force of the Coast Guard. 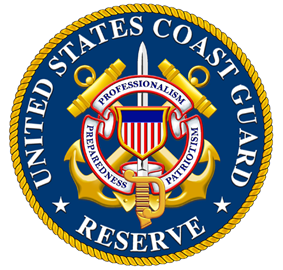 The Coast Guard Reserve was founded on 19 February 1941. Coast Guard reservists normally drill two days a month and an additional 12 days of active duty each year, although many perform additional drill and active duty periods, to include those mobilized to extended active duty. Coast Guard reservists possess the same training and qualifications as their active duty counterparts, and as such, can be found augmenting active duty Coast Guard units every day. The planning for the unit began after the terrorist attacks of 11 September 2001, and culminated with its formation on 20 July 2007. Its missions include maritime law enforcement, anti-terrorism, port security, pollution response, and diving operations. 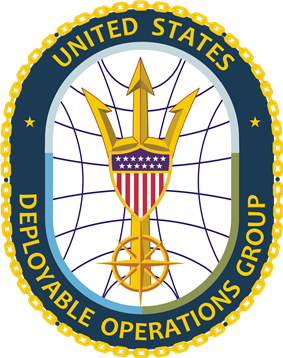 The Deployable Operations Group (DOG) was a Coast Guard command established in July 2007. The DOG established a single command authority to rapidly provide the Coast Guard, Department of Homeland Security, Department of Defense, Department of Justice and other interagency operational commanders adaptive force packages drawn from the Coast Guard's deployable specialized force units. The DOG was disbanded in April 2013 and its deployable specialized forces (DSF) units were placed under the control of area commanders. Live fire exercises by Coast Guard boat and cutter crews in U.S. waters of the Great Lakes was proposed in 2006 and attracted attention in the U.S. and Canada. The Coast Guard had proposed the establishment of 34 locations around the Great Lakes where live fire training using vessel-mounted machine guns were to be conducted periodically throughout the year. The Coast Guard said that these exercises are a critical part of proper crew training in support of the service's multiple missions on the Great Lakes, including law enforcement and anti-terrorism. Those who raised concerns about the firing exercises commented about safety concerns and that the impact on commercial shipping, tourism, recreational boating and the environment may be greater than what the Coast Guard had stated. The Coast Guard took public comment and conducted a series of nine public meetings on this issue. After receiving more than 1,000 comments, mostly opposing the Coast Guard's plan, the Coast Guard announced that they were withdrawing their proposal for target practice on the Great Lakes, although a revised proposal may be made in the future. Aging vessels is another problem, with the Coast Guard still operating some of the oldest naval vessels in the world. In 2005, the Coast Guard terminated contracts to upgrade the 110-foot (34 m) Island-class cutters to 123-foot (37 m) cutters because of warping and distortion of the hulls. In late 2006, Admiral Thad Allen, Commandant of the Coast Guard, decommissioned all eight of the modified cutters due to dangerous conditions created by the lengthening of the hull - to include compromised watertight integrity. The Coast Guard has, as a result of the failed conversion, revised production schedules for the Fast Response Cutter (FRC). Of the world's 40 largest navies and coast guards, the U.S. Coast Guard has the 38th oldest surface fleet. Lack of coverage affects many areas with high maritime traffic. For example, local officials in Scituate, Massachusetts, have complained that there is no permanent Coast Guard station, and the presence of the Coast Guard in winter is vital. One reason for this lack of coverage is the relatively high cost of building storm-proof buildings on coastal property; the Cape Hatteras station was abandoned in 2005 after winter storms wiped out the 12-foot (3.7 m) sand dune serving as its protection from the ocean. Faced with these issues the Coast Guard has contracted with General Dynamics C4 System to provide a complete replacement of their 1970s era radio equipment. Rescue 21 is the United States Coast Guard's advanced command, control and communications system. Created to improve the ability to assist mariners in distress and save lives and property at sea, the system is currently being installed in stages across the United States. The nation's existing maritime search and rescue (SAR) communications system has been in operation since the early 1970s. Difficult to maintain, increasingly unreliable and prone to coverage gaps, this system no longer meets the safety needs of America's growing marine traffic. In addition, it is incapable of supporting the Coast Guard's new mission requirements for homeland security, which require close cooperation with Department of Defense agencies as well as federal, state and local law enforcement authorities. Modernizing this system enhances the safety and protection of America's waterways. Cadets at the U.S. Coast Guard Academy have access to standard Coast Guard uniforms, including Service Dress Blues and the ODU, however, also wear two different styles of parade dress uniforms. Fall Parade Dress Blue consists of navy blouses with banded collars and double rows of buttons, worn with matching navy trousers and a white peaked hat. Spring Parade Dress Blue substitutes white trousers in lieu of navy. The Coast Guard Pipe Band, a special musical unit composed of active, reserve and auxiliary coast guardsmen, wears a modified form of highland dress, including kilt and sporran. It is, along with the Band of the Air Force Reserve Pipe Band, one of only two kilted unit in the United States military, excluding those maintained by state defense forces and service academies. The band's kilt is patterned in the official U.S. Coast Guard tartan. Coast Guard cadets wearing fall Parade Dress Blue uniform dress their line. Coast Guard personnel serving in expeditionary combat units such as Port Security Units, Law Enforcement Detachments, and others, wear the Camouflage Utility Uniform (CUU) with the woodland or desert pattern/color scheme based on the operational commander's guidance. An eight-point cap is worn with rank insignia. The camouflaged utility sun hat may be worn when prescribed by the operational commander, without rank insignia. The current working uniform of the Coast Guard is the Operational Dress Uniform (ODU). The ODU may be worn year-round primarily as a field utility and watchstanding uniform, and may be worn in an office environment. The ODU is similar to the Battle Dress Uniform of other armed services, both in function and style. However, the ODU is in a solid dark blue with no camouflage pattern and does not have lower pockets on the blouse. The first generation ODU, wearable until 1 July 2012 was worn tucked in. The second generation ODU is worn untucked and has black Coast Guard insignia embroidered on the left shirt pocket as well as the side pockets of the trousers. The ODU is worn with composite-toed boots in most circumstances, but low-cut brown boat shoes may be prescribed for certain vessel boarding operations. A standard baseball-style ball cap is worn, embroidered in gold block lettering with "U.S. Coast Guard." Units may also additionally authorize ball caps with the unit name embroidered for wear while on the unit. A foul weather parka is the outerwear worn with the ODU. The former dark blue working uniform has been withdrawn from use by the Coast Guard but may be worn by Auxiliarists until no longer serviceable. 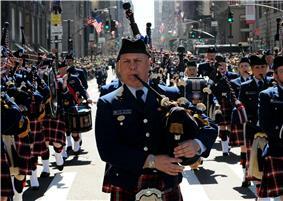 The U.S. Coast Guard Pipe Band in New York during the 2010 Thanksgiving parade. Coast Guard officers also have dress white uniforms, nearly identical to the choker white uniforms worn by naval officers (aside from service-specific buttons, insignia and sword design), typically used for formal parade and change-of-command ceremonies. For similar occasions enlisted members wear Tropical Blue, Service Dress Blue, or Full Dress Blue. Full Dress Blue replaces the light blue shirt with a white shirt, and full size medals are worn on the jacket. A white belt may be worn for honor guards. Mess dress uniforms are worn by members for formal (black tie) evening ceremonies. Like the officers' dress white uniforms, the mess dress uniforms are identical to those of the Navy, aside from Coast Guard-specific insignia. The Tropical Blue variation, worn in warm weather, omits the jacket and tie, and features a short sleeve shirt with rank insignia on shoulder boards for officers, and pin-on collar insignia for petty officers. The Tropical Blue uniform may be worn year-round for general office wear and for visits between commands. It may be worn in lieu of the SDB uniform, but not to functions where civilian dress is coat and tie. The SDB uniform may be worn year-round for business within the Coast Guard and for social occasions where the civilian equivalent is coat and tie. 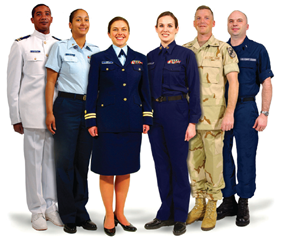 In 1972, the current Coast Guard Service Dress Blue (SDB) uniform was introduced for wear by both officers and enlisted personnel; the transition was completed during 1974. The uniform consists of a blue four-pocket single breasted jacket and trousers. A light-blue button-up shirt with a pointed collar, two front button-flap pockets, and shoulder loops, along with a tie of the same shade as the jacket are worn with the uniform. 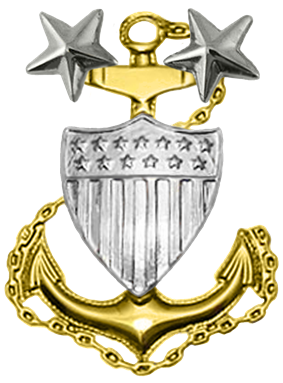 Officer rank insignia parallels that of the Navy but with the gold Navy line star replaced with the gold Coast Guard Shield and with the Navy blue background color replaced by Coast Guard blue. Enlisted rank insignia is also similar to the Navy with the Coast Guard shield replacing the eagle on collar and cap devices. Group Rate marks (stripes) for junior enlisted members (E-3 and below) also follow Navy convention with white for seaman, red for fireman, and green for airman. In a departure from the Navy conventions, all petty officers E-6 and below wear red chevrons and all chief petty officers wear gold. Unlike the Navy, there are no khaki uniforms, and all personnel wear the same color uniform. 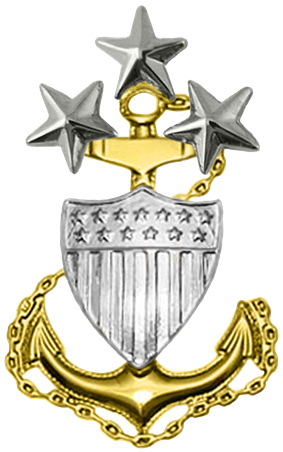 Prior to 1972, Coast Guard personnel wore the same uniforms as the Navy with distinctive Coast Guard insignia, primarily distinctive cap devices for officers and chief petty officers, incorporation of the Coast Guard shield in lieu of line or staff corps insignia for officers, and different buttons on dress uniforms. Two Pantone colors are named after the Coast Guard; they are used in the Service Mark. The official march of the Coast Guard is "Semper Paratus" (Latin for "Always Ready"). The Racing Stripe, officially known as the Service Mark, was designed in 1964 by the industrial design office of Raymond Loewy Associates to give the Coast Guard a distinctive, modern image. Loewy had designed the colors for the Air Force One fleet for Jackie Kennedy. President Kennedy was so impressed with his work, he suggested that the entire Federal Government needed his make-over and suggested that he start with the Coast Guard. First used in 1967, it consists of a narrow blue stripe, a narrow white stripe between, and a broad CG red bar with the Coast Guard shield centered. The stripes are canted at a 64 degree angle, coincidentally the year the Racing Stripe was designed. The racing stripe is borne by Coast Guard cutters, aircraft, and many boats. Red-hulled icebreaker cutters and most HH-65/MH-65 helicopters (i.e., those with a red fuselage) bear a narrow white bar, a narrow blue bar, and broad white bar, with the Coast Guard shield centered. Conversely, black-hulled cutters (such as buoy tenders and inland construction tenders) use the standard racing stripe. Auxiliary vessels maintained by the Coast Guard also carry the Racing Stripe, but in inverted colors (i.e., broad blue stripe with narrow white and CG red stripes) and the Auxiliary shield. This unofficial motto of the Coast Guard dates to an 1899 United States Lifesaving Service regulation, which states in part: "In attempting a rescue, ... he will not desist from his efforts until by actual trial, the impossibility of effecting a rescue is demonstrated. The statement of the keeper that he did not try to use the boat because the sea or surf was too heavy will not be accepted, unless attempts to launch it were actually made and failed." 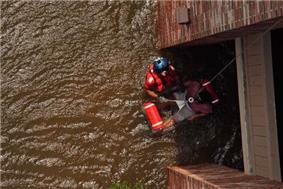 The regulation was silent as to what happens to the rescuer if the attempt fails. In an ALCOAST message effective 1 December 2011 the Commandant, Admiral Papp, directed that the language of Guardian Ethos be superseded by the Coast Guard Ethos in an effort to use terminology that would help with the identity of personnel serving in the Coast Guard. The term Coast Guardsman is the correct form of address used in Title 14 USC and is the form that has been used historically. Respect: We value our diverse workforce. We treat each other with fairness, dignity and compassion. We encourage individual opportunity and growth. We encourage creativity through empowerment. We work as a team. Units within the Deployable Operations Group also employ specialized weapons including the Mk 18 carbine, Mk 11 precision rifle, and M203 grenade launcher. Marksmen from the Helicopter Interdiction Tactical Squadron and Law Enforcement Detachments use a variant of the Barrett M107 .50-caliber rifle to disable the engines on fleeing boats. The U.S. Coast Guard uses a wide variety of small arms. 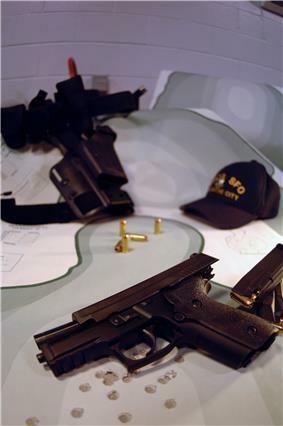 Handguns, shotguns, and rifles are used to arm boat crew and boarding team members and machine guns are mounted aboard cutters, boats, and helicopters. Motor Life Boat (MLB): The Coast Guard's 47-foot (14 m) primary heavy-weather boat used for search and rescue as well as law enforcement and homeland security. Utility Boat (UTB): A 41-foot (12 m) general purpose boat used for nearly all Coast Guard missions. The Coast Guard operates about 1,400 boats, defined as any vessel less than 65 feet (20 m) long, which generally operate near shore and on inland waterways. Fixed-wing aircraft operate from Air Stations on long-duration missions. Helicopters operate from Air Stations and can deploy on a number of different cutters. Helicopters can rescue people or intercept vessels smuggling migrants or narcotics. Since the terrorist attacks of 11 September 2001, the Coast Guard has developed a more prominent role in national security and now has armed helicopters operating in high risk areas for the purpose of maritime law enforcement and anti-terrorism. Coast Guard aviators receive Primary (fixed-wing) and Advanced (fixed or rotary-wing) flight training with their Navy and Marine Corps counterparts at NAS Whiting Field, Florida, and NAS Corpus Christi, Texas, and are considered Naval Aviators. After receiving Naval Aviator Wings, Coast Guard pilots, with the exception of those slated to fly the HC-130, report to USCG Aviation Training Center Mobile, Alabama to receive 6–12 weeks of specialized training in the Coast Guard fleet aircraft they will operate. HC-130 pilots report to Little Rock AFB, Arkansas, for joint C-130 training under the auspices of the 314th Airlift Wing of the U.S. Air Force. The Coast Guard operates approximately 204 fixed and rotary wing aircraft from 24 Coast Guard Air Stations throughout the contiguous United States, Alaska, Hawaii, and Puerto Rico. Most of these air stations are tenant activities at civilian airports, several of which are former Air Force Bases and Naval Air Stations, although several are also independent military facilities. 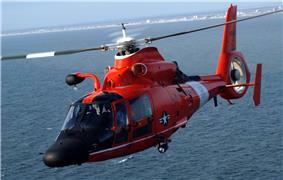 Coast Guard Air Stations are also located on active Naval Air Stations, Air National Guard bases, and Army Air Fields. Polar-class icebreaker (WAGB): There are three WAGB's used for icebreaking and research though only two, the heavy 399-foot (122 m) Polar Star and the newer medium class 420-foot (130 m) Healy, are active. Polar Sea is located in Seattle, Washington but is not currently in active service. Medium Endurance Cutter (WMEC): These are mostly the 210-foot (64 m) Reliance class, and the 270-foot (82 m) Famous class cutters, although the 283-foot (86 m) Alex Haley also falls into this category. Primary missions are law enforcement, search and rescue, and military defense. Seagoing Buoy Tender (WLB): These 180-and-225-foot (55 and 69 m) ships are used to maintain aids to navigation and also assist with law enforcement and search and rescue. Originally, the U.S. Coast Guard used the term cutter in its traditional sense, as a type of small sailing ship. Today it officially uses the term for any vessel that has a permanently assigned crew and accommodations for the extended support of that crew, and includes only and all vessels of 65 feet (20 m) or more in length. USCGC Stratton, the third Legend-class maritime security cutter. 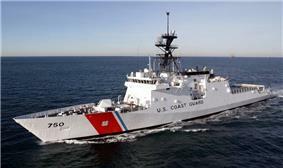 USCGC Bertholf, the first Legend-class maritime security cutter. The Coast Guard employs over 7,700 civilians in over two hundred different job types including Coast Guard Investigative Service special agents, lawyers, engineers, technicians, administrative personnel, tradesmen, and federal firefighters. Civilian employees work at various levels in the Coast Guard to support its various missions. Newly enlisted personnel are sent to eight weeks of recruit training at Coast Guard Training Center Cape May in Cape May, New Jersey. New recruits arrive at Sexton Hall and remain there for three days of initial processing which includes haircuts, shots, uniform issue, and other necessary entrance procedures. During this initial processing period, the new recruits are led by temporary company commanders. These temporary company commanders are tasked with teaching the new recruits how to march and preparing them to enter into their designated company. The temporary company commanders typically do not enforce any physical activity such as push ups or crunches. When the initial processing is complete, the new seaman recruits are introduced to their permanent company commanders who will remain with them until the end of training. There is typically a designated lead company commander and two support company commanders. The balance of the eight-week boot camp is spent in learning teamwork and developing physical skills. An introduction of how the Coast Guard operates with special emphasis on the Coast Guard's core values is an important part of the training. 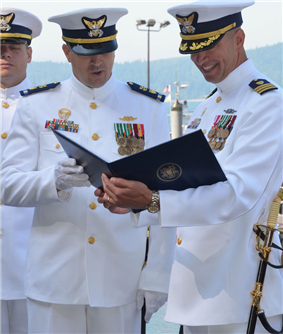 Graduates of OCS are usually commissioned as ensigns, but some with advanced graduate degrees may enter as lieutenants (junior grade) or lieutenants. Graduating OCS officers entering active duty are required to serve a minimum of three years, while graduating reserve officers are required to serve four years. Graduates may be assigned to a cutter, flight training, a staff job, or an operations-ashore billet. In addition to the Academy, prospective officers, who already hold a college degree, may enter the Coast Guard through Officer Candidate School (OCS), also located at the Coast Guard Academy. OCS is a seventeen week course of instruction that prepares candidates to serve effectively as officers in the Coast Guard. In addition to indoctrinating students into a military lifestyle, OCS provides a wide range of highly technical information necessary to perform the duties of a Coast Guard officer. The U.S. Coast Guard Academy is a four-year service academy located in New London, Connecticut. Approximately 225 cadets graduate each year, receiving a Bachelor of Science degree and a commission as an ensign in the Coast Guard. 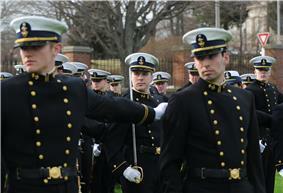 Graduates are obligated to serve a minimum of five years on active duty. Most graduates are assigned to duty aboard Coast Guard cutters immediately after graduation, either as Deck Watch Officers (DWOs) or as Engineer Officers in Training (EOITs). Smaller numbers are assigned directly to flight training at Naval Air Station Pensacola, Florida or to shore duty at Coast Guard Sector, District, or Area headquarters units. is named for the SPARS. USCGC Spar The cutter  Later,  In 1918, twin sisters Genevieve and Lucille Baker of the Naval Coastal Defense Reserve became the first uniformed women to serve in the Coast Guard. Highly qualified enlisted personnel in pay grades E-6 through E-9 with a minimum of eight years experience can compete each year for appointment as warrant officers (WO). Successful candidates are chosen by a board and then commissioned as chief warrant officers (CWO-2) in one of sixteen specialties. Over time, chief warrant officers may be promoted to CWO-3 and CWO-4. The ranks of warrant officer (WO-1) and chief warrant officer (CWO-5) are not currently used in the Coast Guard. Chief warrant officers may also compete for the Chief Warrant Officer to Lieutenant Program. If selected, the warrant officer will be promoted to lieutenant (O-3E). The "E" designates over four years active duty service as a warrant officer or enlisted member and entitles the member to a higher rate of pay than other lieutenants. Commissioned officers in the Coast Guard hold pay grades ranging from O-1 to O-10 and have the same rank structure as the Navy. Officers holding the rank of ensign (O-1) through lieutenant commander (O-4) are considered junior officers, commanders (O-5) and captains (O-6) are considered senior officers, and rear admirals (O-7) through admirals (O-10) are considered flag officers. The Commandant of the Coast Guard is the only member of the Coast Guard to hold the rank of admiral. The formal name for a uniformed member of the Coast Guard is "Coast Guardsman", irrespective of gender. "Coastie" is an informal term commonly used to refer to current or former Coast Guard personnel. In 2008, the term "Guardian" was introduced as an alternative, but was later dropped. Admiral Robert J. Papp, Jr. stated that it was his belief that no Commandant had the authority to change what members of the Coast Guard are called as the term Coast Guardsman is found in Title 14 USC which established the Coast Guard in 1915. "Team Coast Guard" refers to the four components of the Coast Guard as a whole: Regular, Reserve, Auxiliary, and Coast Guard civilian employees. Shore establishment commands exist to support and facilitate the mission of the sea and air assets. U.S. Coast Guard Headquarters is located in Southwest Washington, DC. Other shore establishments are Coast Guard Sectors (which may include Coast Guard Bases), Coast Guard Stations, Coast Guard Air Stations, and the United States Coast Guard Yard. Training centers include the United States Coast Guard Academy, Training Center Petaluma, Training Center Cape May, Coast Guard Aviation Technical Training Center, Coast Guard Aviation Training Center Mobile, and Training Center Yorktown. The new Department of Homeland Security headquarters complex is being built on the grounds of the former St. Elizabeths Hospital in the Anacostia section of Southeast Washington, across the Anacostia River from former Coast Guard headquarters. In times of war, the Coast Guard or individual components of it can operate as a service of the Department of the Navy. This arrangement has a broad historical basis, as the Coast Guard has been involved in wars as diverse as the War of 1812, the Mexican-American War, and the American Civil War, in which the cutter Harriet Lane fired the first naval shots attempting to relieve besieged Fort Sumter. The last time the Coast Guard operated as a whole within the Navy was in World War II. More often, military and combat units within the Coast Guard will operate under Navy or joint operational control while other Coast Guard units will remain under the Department of Homeland Security. The modern Coast Guard can be said to date to 1915, when the Revenue Cutter Service merged with the Lighthouse Service was brought under the Coast Guard's purview. In 1942, the Bureau of Marine Inspection and Navigation was transferred to the Coast Guard. In 1967, the Coast Guard moved from the U.S. Department of the Treasury to the newly formed U.S. Department of Transportation, an arrangement that lasted until it was placed under the U.S. Department of Homeland Security in 2002 as part of legislation designed to more efficiently protect American interests following the terrorist attacks of 11 September 2001. "First Fleet" is a term occasionally used as an informal reference to the Coast Guard, although there is no indication that the United States has ever officially used this designation with reference either to the Coast Guard or any element of the Navy. The informal appellation honors the fact that between 1790 and 1798, there was no United States Navy and the cutters that were the predecessors of the Coast Guard were the only warships protecting the coast, trade, and maritime interests of the new republic. 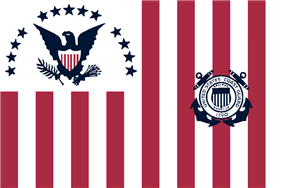 The roots of the Coast Guard lie in the United States Revenue Cutter Service established by Alexander Hamilton under the Department of the Treasury on 4 August 1790. The first Coast Guard station was in Newburyport, Massachusetts. Until the re-establishment of the Navy in 1798, the Revenue Cutter Service was the only naval force of the early United States. It was established to collect taxes from a brand new nation of patriot smugglers. When the officers were out at sea, they were told to crack down on piracy; and to rescue any mariners in distress. 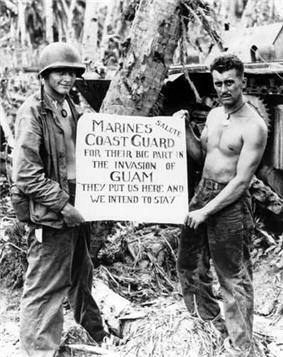 Private First Class William A. McCoy and Private First Class Ralph L. Plunkett holding a sign thanking the U.S. Coast Guard after the Battle of Guam. Coast Guardsmen have the legal authority to carry their service-issued firearms on and off base. This is rarely done in practice, however; at many Coast Guard stations, commanders prefer to have all service-issued weapons in armories. Still, one court has held that Coast Guard boarding officers are qualified law enforcement officers authorized to carry personal firearms off-duty for self-defense. Title 14 USC, section 2 authorizes the Coast Guard to enforce federal law. This authority is further defined in Title 14 USC, section 89, which gives law enforcement powers to all Coast Guard commissioned officers, warrant officers, and petty officers. Unlike the other branches of the United States Armed Forces, which are prevented from acting in a law enforcement capacity by Title 18 USC, section 1385, the Posse Comitatus Act, and Department of Defense policy, the Coast Guard is exempt from and not subject to the restrictions of the Posse Comitatus Act. A member of Law Enforcement Detachment (LEDET) 106 performs a security sweep aboard a tanker ship in the North Persian Gulf in July 2007. On 25 November 2002, the U.S. Department of Homeland Security. The transfer of administrative control from the U.S. Department of Transportation to the U.S. Department of Homeland Security was completed the following year, on 1 March 2003.